As you rightly said whoever gets elected in your presidential election the role of class-based trade unions is imminent for the future of the World Working Class movement to achieve the goal. The Asia-Pacific affiliates of WFTU will also benefit from your conclusions and action programs. We send our revolutionary greetings for the success of your conference. As I am also the Working President of the All India Trade Union Congress, the oldest and foremost trade union of the Indian Working Class, I convey the greetings of the 14-million strong AITUC also for the success of your conference. We extend our greetings to all the comrades who gather at this 58th Workers World Party Conference from the Puerto Rico Trade Union Coordinator and its member unions. On Nov. 8, 2016, the electoral processes in Puerto Rico and the United States ended, with results that we all know. In Puerto Rico, electoral abstention increased, the dislike among the population with traditional parties favored independent candidates to the detriment of alternatives for political and social change. In the end elected governor, with 40 percent of the votes, was Dr. Ricardo Rosselló, who favors the assimilation of Puerto Rico into the U.S., the market system, neoliberal measures and a political party stained by a history of corruption. The representatives of the capitalist system, based on a discourse of supposed progress and welfare for the working class, were favored. In essence, this result did not substantially change the governing forces between the incumbent party and the newly elected party. Their “victories” occur within an electoral system that cannot produce real changes, since it is not democratic. In the case of Puerto Rico, the electoral process resulted in an exercise in futile governance since, since September 2016, a Fiscal Control Board, consisting of seven members appointed by the President of the United States, among candidates suggested by the U.S. Congress. The powers and faculties of the Junta occupy the space belonging to the government of the island. The governor participates with voice but without vote and the legislature has to refer all legislation for the final approval of the Junta. This demonstrates the colonial character of Puerto Rico and the imperial nature of the U.S. relationship with Puerto Rico. Most political and social sectors recognize this status as being one of a colony — and the need to obtain a status of dignity. A small group of politicians refuse to acknowledge what everyone says: Puerto Rico is a colony. However, the economic sectors, with interests and economic power in Puerto Rico seem to ignore the colonial condition. For them, the colony is part of doing business. These sectors are only interested in collecting the illegal debt of $72 billion, so they imposed the Fiscal Control Board to manage their collection, create conditions to enable credit in Puerto Rico and to continue to increase debt. The progressive forces in Puerto Rico, among which is the PR Union Coordinator, which in turn groups a dozen class unions, denounce the fact that our nation is a victim of colonialism and capitalist exploitation. We say that our struggle must be linked to the desire to transform the society we live in to a society where equality and solidarity prevail, and where respect for human rights and the dignity of the human being [are] the rule. The highest wages, better conditions and benefits in employment are worth nothing if they are based on the inequality or exploitation of other nations and social sectors. It is in this context that we wish to greet the 58th Conference of the Workers World Party, hoping that all political and organizational objectives will be achieved in order to be effective and to advance the struggle. Receive from the workers who we represent, as well as from the leadership of our organizations, a brotherly and caring embrace, in the best spirit of internationalist struggle. Long live the united working class! Freedom for Oscar López Rivera! Nov. 10 — On the occasion of the National Conference of the Workers World Party, the Popular Front for the Liberation of Palestine extends its greetings of solidarity and struggle to your party, dedicated to consistently confronting imperialism, racism and settler colonialism at the heart of the imperial monster that threatens the people of the world and our struggling people in Palestine. 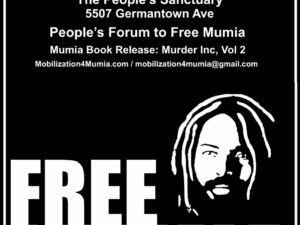 Today, perhaps more than ever, revolutionary organizing and revolutionary parties are a critical necessity for liberation movements. The results of the latest election — and the choices available in that election — showcase the endless brutality and racism of U.S. imperialism. Clinton and Trump promised yet more war, exploitation, deportations, racism and oppression. 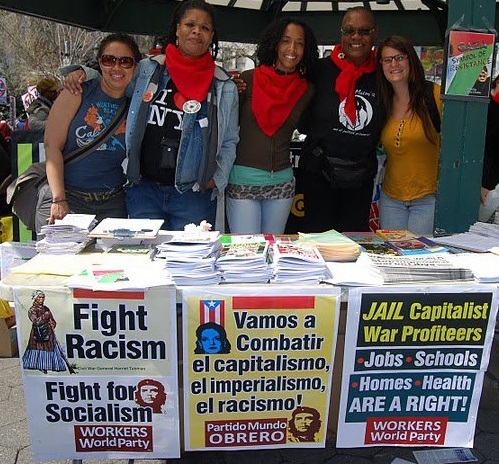 The only solution for the people is revolutionary organizing for revolutionary struggle, not to elect candidates of the Democratic party but to overturn the system of racism, settler colonialism, capitalism and imperialism that produced Trump and Clinton and the deadly threat they pose to the peoples inside and outside the borders of the United States. Every United States president is a deadly threat to the peoples of the world: drone strikes, extrajudicial execution, coups, massacres, funding of mercenaries, direct invasions, aerial bombing, “no-fly zones,” sanctions, destabilization, installation of puppet regimes and economic sabotage are but a small portion of the consistent tactics of U.S. imperialism against the peoples of Asia, Africa and Latin America. This is a critical time to rise up against imperialism, to rise up against racism, to rise up against capitalism, to rise up against Zionism. To stand with the Black Liberation movement and to fight alongside Indigenous people in Standing Rock and across their stolen land for justice, liberation and self-determination. To stand with migrants and refugees, for the liberation of Puerto Rico, to bring down the prison-industrial complex, and to confront capitalism and the ruling class. 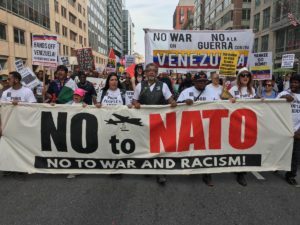 This is the time to build a mass movement to confront U.S. imperialism and its war drive around the world, in Syria, Yemen and every nation under the bombs, sanctions and threats of empire. Every victory for the movements of the people is a victory for Palestine — and every victory for the Palestinian movement for national liberation is a victory for people’s movements internationally. The Workers World Party has a long and proud history of steadfast struggle for Palestinian liberation. Throughout the history of the Palestine solidarity movement and Palestinian community organizing in the United States, WWP has always been there, dedicated and committed to the fight against imperialism and Zionism, for the return of Palestinian refugees, the liberation of Palestine, the victory of the Palestinian people and the defeat of the oppressor. We salute your ongoing and committed work to support the Palestinian struggle and break the U.S. imperialist-Zionist alliance that chains the Palestinian people. We particularly note your commitment to the struggle for the freedom of the Palestinian political prisoners, the leaders of the Palestinian people behind Zionist bars and your support for the Samidoun Palestinian Prisoner Solidarity Network and other Palestinian and Palestine solidarity organizations across the United States such as Students for Justice in Palestine, Al-Awda and all of the groups working to build the campaign for the international boycott and isolation of the Zionist state of Israel. Our General Secretary, Ahmad Sa’adat, is one of the leaders of the Palestinian prisoners’ movement and the Palestinian liberation movement overall. The struggle to liberate Palestinian political prisoners is at the core of the struggle for the liberation of Palestine, from the river to the sea. This is not the moment for retreat; on the contrary, this can be, and must be, a time for revolutionary struggle and confrontation of racism, settler colonialism, capitalism, imperialism and Zionism. Together we march for the liberation of Palestine and the liberation of the world, not only from Donald Trump, but from the systems of power and the ruling class that he represents today. We are delighted to have recently met with your comrade Taryn when she was visiting London. It was inspiring to hear of the important work you are doing in the growing movement in the U.S., notably in the Black struggle and solidarity with migrants, as well as in support of socialist Cuba. We were very pleased to discuss with Taryn the political work we are engaged in, in Britain, with much of our work currently focusing on the housing crisis and state racism. With the election of Donald Trump, it is clear we are entering a very reactionary period, where the crisis of imperialism is throwing up new contradictions. The racism, sexism and warmongering of the imperialist states is becoming ever more naked. The wars the imperialist states, led by the U.S. and Britain, are imposing upon much of the world are testament to the deepening crisis, and the lengths the imperialists will go to defend their crumbling system. The threat of devastating global war is ever present. The imperialist destruction of the environment proves once again that under capitalism, human society has no future. In this context, it is even more important that revolutionary anti-imperialist forces are organising, gaining strength and challenging opportunists who will attempt to divert the struggle behind social democracy. Rosa Luxembourg summed up our options in 1916 — socialism or barbarism. We are comforted to know that the Workers World Party is an organization which will be challenging opportunism, fighting imperialism and fighting for socialism, as the new period develops. We send our full solidarity to comrades attending the Workers World Party conference, and we stand with you in the struggles ahead. Hasta la victoria siempre! Dear comrades, In these days the controversy around the U.S. presidential election has also become a main topic in the bourgeois mass media in Germany. The ultra-reactionary, proto-fascist Donald Trump, as well as the former Secretary of State Hillary Clinton, both represent U.S. state-monopoly capitalism. For the working class, the exploited and oppressed masses this election is like a choice between plague and cholera, but no real alternative. It was therefore important that we could publish an interview with your presidential candidate Monica Moorehead in our Rote Fahne magazine. For us the U.S. election campaign shows a growing societal polarization, a development which is also taking place in Germany and in other European countries. The material foundation is the general proneness to crisis of the imperialist world system. The world economy is in an extremely unstable state. Harbingers of a new worldwide economic and financial crisis are increasing in number. The worldwide environmental crisis is intensifying unbridled. Wars and political crises are destabilizing bourgeois society. The fact that masses of people criticize both candidates and the dirty election campaign shows that, also in the USA, a growing part of the masses are open for the criticism of capitalism and the search for a societal alternative. In this situation it is important that the working class retains its political independence and takes an independent stand. It is crucial that the revolutionary forces are strengthened and that advances are made in building up a strong Marxist-Leninist party in the USA. In answer to the [German Chancellor Angela] Merkel government’s shift to the right we have taken the initiative to successfully found an internationalist alliance of progressive and revolutionary forces in Germany. A number of revolutionary migrant organizations have also joined in. The national elections taking place in Germany in 2017 are not the goal, but a good occasion for building this up. Therefore the alliance will also be taking part in these elections as Internationalist List/MLPD. The intended strengthening of the revolutionary pole has significance far beyond the elections. We will also be using next year’s anniversary of “100 years October Revolution” and the ICOR [International Coordination of Revolutionary Parties and Organizations] campaign for this aim. In order to solve the important existential questions, imperialism must be overcome by revolution and socialism must be built up. This also requires increased international cooperation among the Marxist-Leninist and revolutionary forces. Nov. 7 — First, on my own behalf and on behalf of the party “Our Home is Moldova” (Red Bloc), I warmly congratulate you on the anniversary of the Great October Socialist Revolution. It is symbolic that you hold your National Conference during those days in which, 99 years ago, history was changed, the world was changed. To be a real opposition force in the face of savage capitalism is a hard burden, but I am confident that Workers World Party will overcome all hardships and troubles in its path. The international left movement is going through a difficult period. In many countries of the world, champions of leftist ideas and values are persecuted and repressed by the authorities, who deal with dissent by fabricating criminal cases, by censorship, by pressure on the media, by violating fundamental human rights — the right to live, freedom of expression, freedom of conscience. In this challenging time, it is important to be unified, cohesive, to stand shoulder to shoulder in the struggle against world imperialism, in the struggle for human rights, peace, freedom, equality and brotherhood among all peoples of the world, all working people. We express our gratitude for your support for us in our difficult struggle, and we express our sincere solidarity with you and all people in the U.S. who fight against the neoliberal machine, in the struggle for a decent life, for justice, freedom and genuine democracy. We sincerely hope you strengthen and expand the ranks of your party to achieve the tasks before you. *Note: Grigory Petrenko is one of seven Red Bloc members known as the Petrenko Group, who were unjustly imprisoned for several months in 2015 and early 2016 for leading anti-oligarchy protests. The Petrenko Group is still subject to repressive conditions imposed by the court and its members face many years in prison after a trial. The Workers Central of Cuba, its National Trade Unions and the Cuban workers wish to express the warmest and most cordial greetings to the Workers World Party on the occasion its 58th annual Conference. We recognize the epic struggle you are fighting in the United States against the hegemony of the powerful, and to place the large, largely dispossessed majorities in their rightful place. For us you have been and we are sure that you will continue to be bulwarks in the defense of our people, in the battle that they fought for the liberation of our 5 heroes, who are already at home, and for the elimination of the unjust and criminal blockade to which the United States subjects our homeland, and for the return of the territory of the naval base of Guantánamo that it occupies illegally against the will of our people. We wish you success in the topics to be debated and in the results that will emanate for the future of your partisan organization. Receive an affectionate and revolutionary greeting from the Citizen’s Pole of Panama. Surely, when your National Conference meets, you will be forced to have an evaluation of the elections in the United States. Elections defined primarily by two sides of the same coin, Hillary Clinton and Donald Trump. Between them there are only differences of styles and minor nuances, but the very essence of an imperialist regime responsible for the economic and ecological plunder of the world; involving genocidal wars from Libya to Afghanistan, including Palestine, Syria and Iraq; guilt for a growing humanitarian crisis that forces millions of human beings to flee their countries seeking a hope of survival. This regime is also responsible for a blatantly racist policy in its own territory against Afro-Americans and Latin Americans. The political regime of the United States, shared by Democrats and Republicans, openly promoting economic sabotage, political instability and coups d’état against independent governments in Latin America: including the (failed) coup against Hugo Chávez in 2002, against Jean-Bertrand Aristide in Haiti In 1984, against Miguel Zelaya in Honduras in 2009, against Lugo in Paraguay in 2012, against Dilma Rousseff in Brazil in 2016, the continuous coup attempt against Nicolás Maduro in Venezuela from 2014 until now, the continuation of the blockade against socialist Cuba, and the failed overthrows aimed at the governments of Evo Morales in Bolivia and Rafael Correa in Ecuador. Comrades of the Workers World, you have a great responsibility on your shoulders, for you must fight against U.S. imperialism from within, and there construct a working-class, popular and socialist alternative that will help liberate the world from exploitation, oppression and discrimination. Successes at your National Conference. On behalf of the organizations affiliated to the International Democratic Federation of Women in the Americas and the Caribbean, we send this message of solidarity in greetings to the 58th Conference of the Workers World Party. Our organization is an energetic advocate for Peace, the rights of women and all just causes in the world. We express solidarity with the militants of the Workers World Party and declare unconditional support for the new stage of international struggle required by this new administration in the White House. A world of Peace, Solidarity and Social Justice is what the American people of the United States long for. 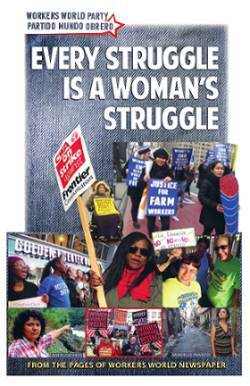 The women of FDIM will support their struggle. From Venezuela, the land of liberators, we follow the events, convinced that capitalism has a structural crisis from which it is increasingly difficult to re-establish itself. That is why Donald Trump’s triumph, against all predictions, defeated the traditional factors of the establishment led by the Zionist lobby and the big multinationals who undoubtedly bet on Hillary Clinton’s candidacy as the salvation of a decaying Empire with deep internal contradictions. For Latin America and the Caribbean it means that the Empire changed to a populist language and a nationalist attitude that borders on the most prehistoric fascism. For the Bolivarian Republic of Venezuela the U.S. administration led by a President Trump generates no expectation of improving relations. We continue in our fight against the counterrevolution with the goal of defeating it. And to defeat it en route on the path of Bolivarian Socialism to a Venezuela with the legacy of Commander Hugo Chávez. Today we know the immense challenges that you brothers and sisters of struggle have in the belly of the fascist monster. We want to wish you every success in your conference. Without many expectations that are generated in this new global situation, we are convinced that capitalism has a structural crisis from which it is increasingly difficult to pull itself together. Donald Trump’s triumph against all odds defeated the traditional factors of the establishment led by the Zionist lobby and the big multinationals which undoubtedly bet on Hillary Clinton’s candidacy as a lifeline for a decaying empire with deep internal contradictions. For Latin America it means that the Empire changed its horse’s rider, replacing it with a populist language and a nationalist attitude that borders on the most prehistoric fascism appealing to the lowest instincts of the North American people. It recalls the discourse of white supremacy of Hitler and the Nazis. For Venezuela this does not generate any expectation of improvement in relations with the U.S. administration under the presidency of Mr. Trump. We continue in our fight against the opposition scoundrels here to defeat it once and for all and lead our country along the path of socialism with the legacy of our Supreme Commander Hugo Chávez Frías under the leadership of our Workers President Nicolás Maduro, the first Chavista and worker president of our history. We know of the immense challenges that you comrades and brothers of struggle have in the belly of the monster that now sticks its claws out in this dangerous turn towards fascism. Knowing of its consequence in the struggle for the poor of the earth, their solidarity with the homeland of Bolívar and Chávez and our deeply Chavista Bolivarian Socialist Revolution, we want to wish you the greatest success in your annual conference. We await the conclusions of such an important debate in this historical conjuncture. Our greetings, comrades. We send you, on behalf of the Free Homeland Party of Brazil, a warm greeting and wish for success at the 58th Conference of the Workers World Party! It is a huge, revolutionary challenge that you, at the heart of the empire, have these days. We accompany you with the certainty that at your meeting are those who are best qualified to face this seemingly new situation. The big media, the weapons used by the polls, the ways to crush the people were a little bit — even a little bit helps — unmasked in this electoral process. Your conference will surely result in a decisive call for the people to take to the streets, to not give up their right, to go further in their demands and their rejections of that policy subjecting not only the people of the USA but all the world. In Brazil we also are living through crucial events, we are struggling to defeat a program that aims to lead us to political backwardness, even greater unemployment and the surrender of our wealth, which is not little. Therefore, comrades, we are with you, we march together! We wish you a Conference where all the ideas, the combativeness and the strength that characterizes your Party will emerge! Long live the 58th Conference of the Workers World Party! Long live the friendship between the people of the USA and Brazil! Long live the friendship between the Workers World Party and the Free Homeland Party! Nov. 9 — The Mexican Electricians Union–New Central of Workers (SME-NCT) salutes the 58th conference of the Workers World Party a few hours after Donald Trump was elected president of the United States. Trump is a sworn enemy of the Mexican migrants in that country. The protests of the democratic and progressive forces, the young and politically conscious workers, the Hispanic and Afro-American communities, the aggrieved women and indignant citizens are in the streets and squares of the main North American cities, repudiating and refusing to recognize as president someone who dedicates state policy to racism, misogyny, hatred and lies. The workers who voted for Trump to express their dissatisfaction with the system and the free market must know that they will be deceived again and that the only way out of the precariousness of life is socialism. We sincerely wish that the 58th Conference of Workers World Party adopt the correct political resolutions that allow them to move towards the construction of a powerful leftist social movement in the United States. A fraternal embrace and solidarity with the people of the United States. On behalf of the Central Committee of the Communist Party of Venezuela we send you militant greetings for the successful unfolding of your 58th Conference. In moments when the maximum unity of the working class and the working people, the maximum unity of the revolutionaries, the strength of a revolutionary political avant-garde that can guide and direct the people are needed, we are sure that your debate and conclusions in the Conference can make this contribution to the political line that is needed in the current times in the United States and Latin America. We must unite to fight for peace and at the same time to win the kind of social justice that can only exist in a socialist society. As you correctly put it: we must keep alive the vision of socialism. Comrades, from Venezuela we accompany you in solidarity and look forward with great interest to the valuable results of these days of reflection and debate. We accompany you in the coming days of new class struggles. From the land of Salvador Allende, a warm and sympathetic greeting to the 58th Conference of the Workers World Party. The situation of society at world level has worsened at economic, social and political levels, culminating in a great destruction of nature and humanity itself and war situations that are having a global reach. With Donald Trump this already grave situation could be deepened. In these conditions, it is now more necessary than ever to strengthen social mobilizations at the level of each country with an internationalist perspective. To this end, it is essential to strengthen the organization and struggle of workers at ever higher levels. U.S. workers now more than ever play a significant role in national struggles with international perspectives. We wish you success in your 58th Conference. Graciela Galarce worked at the Central Bank of Chile, under the government of Comrade Salvador Allende. Orlando Caputo was Allende’s representative and general manager on CODELCO’s Executive Committee and actively participated in the nationalization process of the Great Copper Mining, which were operated and exploited by U.S. companies Anaconda and Kennecott.